The Crown Prince of the Blues pays homage to two of his forefathers. After being one of Mr. Bonamassa’s biggest critics; this double album and DVD package has genuinely won me over and I can honestly say I am now an unashamed fan. 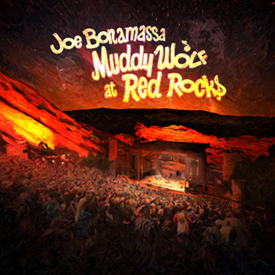 The double live album is a faithful recreation of his tribute concerts at the famous Red Rocks Amphitheatre across the Labor Day weekend in 2014 and the DVD comes with a wonderful extra disc featuring Bonamassa’s road trip to the mythical Crossroads at Clarksdale, a look behind the scenes at the concerts and some footage of Muddy Waters and Howlin’ Wolf that I’d never seen before. As usual with Joe’s work the recording of the concert is pin-sharp and bares repeated plays; which is unusual for me and a Live Album; and the video has just the right amount of cutaways in the edit to keep even those with a short attention span (me!) happy across the two and a half hours. I’ve long been a critic of all the current crop of guitarslingers for their incessant noodling solos; and JB has been at the top of the list; but here; as with his recent excursions with Beth Hart, the solos are all relatively short and impeccably sharp (rarely more than two or three minutes) and the young Maestro is never shy in stepping back and letting the band members have their moment in the spotlight too. The concert is split into three distinct parts; opening with eight Muddy Waters songs; followed by three Wolf tunes; but don’t worry, as the third track is an amazing medley that showcases not only Bonamassa’s dexterity on the guitar but also finds a new range in his voice. Although it was a bit of a surprise to me, Bonamassa finishes with a short set of his own songs; which sends his fans ballistic. I can’t actually think of a track that shouldn’t be here; but there are also gems littered throughout the concert; with the hand-picked band swinging the Hell out of Water’s Stuff You Gotta Watch and Real Love; while that medley of Spoonful/Killing Floor/Evil/All Night Boogie will have me returning to it many times in the coming years. Of his ‘own’ songs Oh Beautiful from his latest album is outstanding; and this is probably my favourite version of Sloe Gin that I’ve heard. On the Extras DVD I heartily recommend you get to see Joe and Kevin’s Excellent Adventure, where Bonamassa and Kevin Shirley drive a big Red Convertible down to the Delta and visit a couple of museums and the mythical Crossroads where Robert Johnson ‘sold his soul to the Devil’. When they find the Crossroads they get out of the car and take some photos, and while talking to the camera, a man from the Diner approaches them with a flyer about the history of the area. The next five minutes had my smiling as the guy not only doesn’t recognise Joe Bonamassa, but when told his name, it doesn’t mean anything to him either. A lesser man would have left that out of the edit; so hats off to Joe! Bonamassa is visibly humbled by the Sell-out crowd of 9,000; which he says is the biggest crowd he’s played to. For some reason I presumed he would have played to bigger crowds; but apart from Festivals can’t think of another modern Blues act who could actually attract that many under their own name, so again ‘hats off to Joe’ for mentioning it. The guitarist gets criticized for his ‘dress sense’ more than anything else; but he makes the point that he wears a sharp suit in homage to artists like Waters and Wolf who treat their audiences with respect by looking smart on stage; and if it was good enough for them it’s good enough for him and his assorted bands. So, there you have it Joe Bonamassa has not only produced a truly excellent Double Live album but has included a bonus DVD in the concert packaging that is well worth watching as a documentary on its own.